The cards are a good fit in my hands, at 2.75″ x 4.75″ and altogether make for a rather slim deck, so it transports easily alongside a tarot deck. The deck description on Stolze’s website notes that the deck is ideal for meditation and contemplation. Mandalas are, in a nutshell, an art form intended to express the artist’s perspective of the universe, or a certain part of the universe. Religiously, they’re used to help establish sacred space. 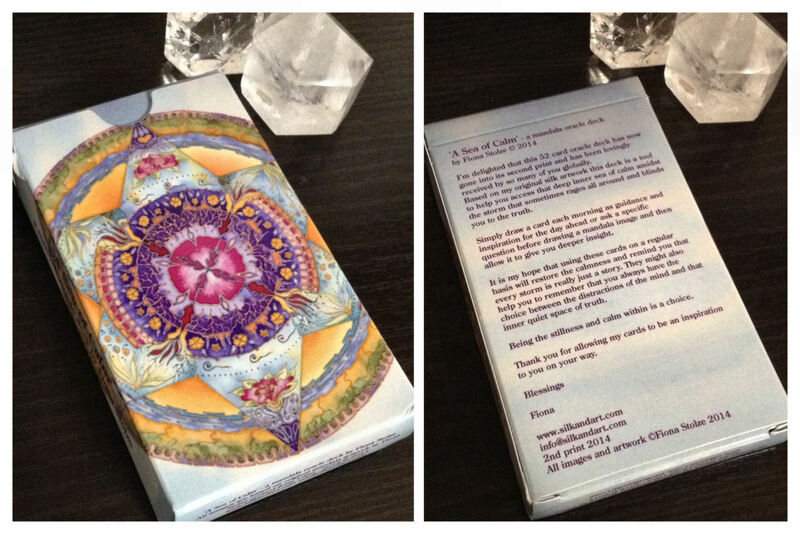 Thus, an oracle deck of mandala art would be ideal for practitioners who use tarot or oracle decks in meditation. I’d imagine they’d work pretty well, too, for work on the astral plane. 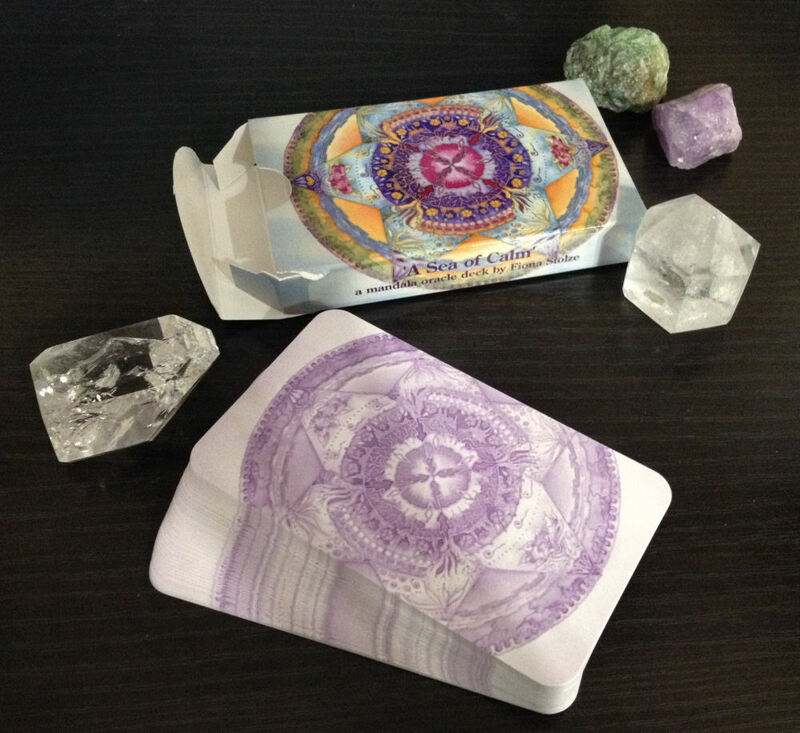 The cards come in a beautiful sky blue box with a mandala that is featured in the cards– Embracing the Divine Feminine. There is a very soft, subdued aesthetic to this deck. It’s also a lovely fusion of Eastern and Western cosmology. 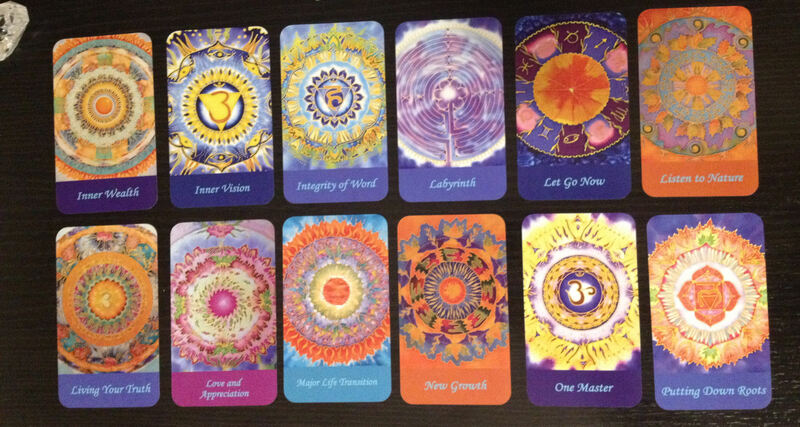 For instance, in the below “Let Go Now” card (second card from the right, top row), you see a mandala designed with the 12 zodiac signs in Western astrology, and yet in other cards, you see Sanskrit characters. 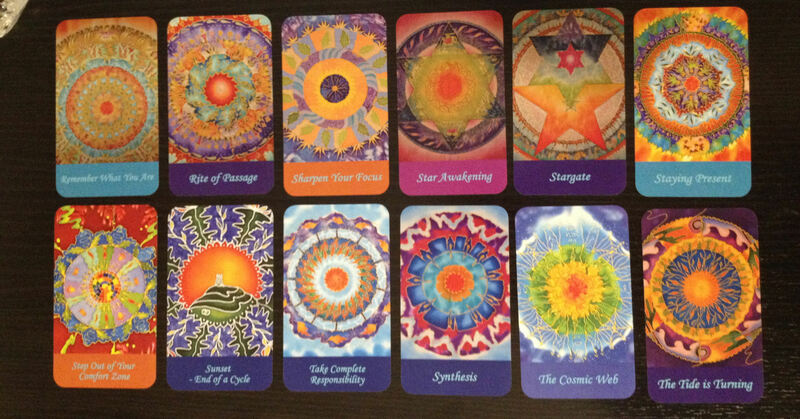 Others have something almost Kabbalistic to the design, like “Stargate” in the below photograph (again, second card from the right, top row). A few incorporate sacred geometry. Mandalas are believed to facilitate connection between the individual and the interconnected Divine. You can also think of that as communication with the higher self, or exploration of the unconscious mind. A way to use these cards is to select one at random and then meditate on the card by gazing into the center focal point. Get lost in the art while meditating on the key words written on the card. Meditate on how that phrase applies to you and what you want to manifest in your life applicable to that phrase. Let the mandala art pull you deeper within yourself to mine those answers. 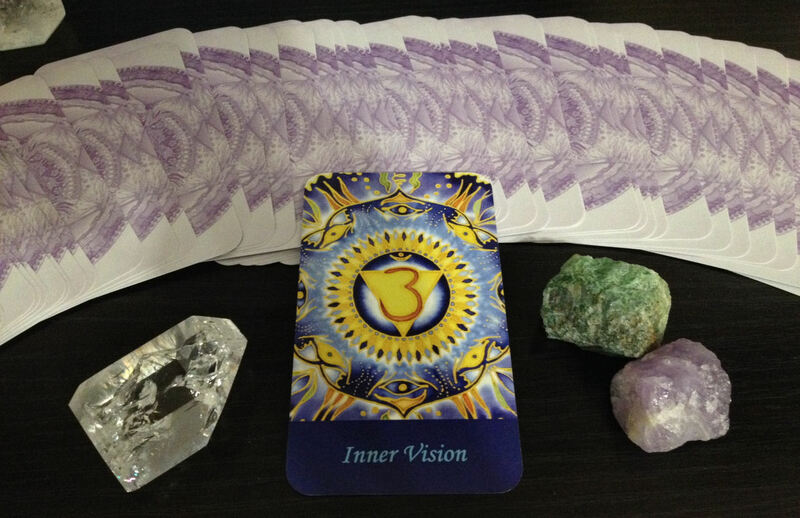 I did a reading on myself and pulled “Inner Vision,” or Card 25 (per the Guidebook that accompanies the deck; note that the cards themselves are unnumbered). You begin to see things with new eyes. You have great insights about things around you that others don’t. Time to put your trust in the knowing that comes to you from deep within. You are starting to develop new clairvoyant skills, seeing where you didn’t before. Learn to discern when to share and when to remain silent about what you ‘see’ relating to others. The deck comes with a 12-page PDF Guidebook that you can download once you’ve received your deck. A link is given for the download. Since the box for the deck has just a smidge of empty space left in it even after you slide in the deck, I printed out pages 4-12 of the PDF, which are the pages containing the card meanings, and slipped them in as inserts with the deck. The Guidebook also presents a daily guidance exercise where you shuffle the cards first thing in the morning and pull one for your daily message. A three-card reading is also taught for answering specific questions. 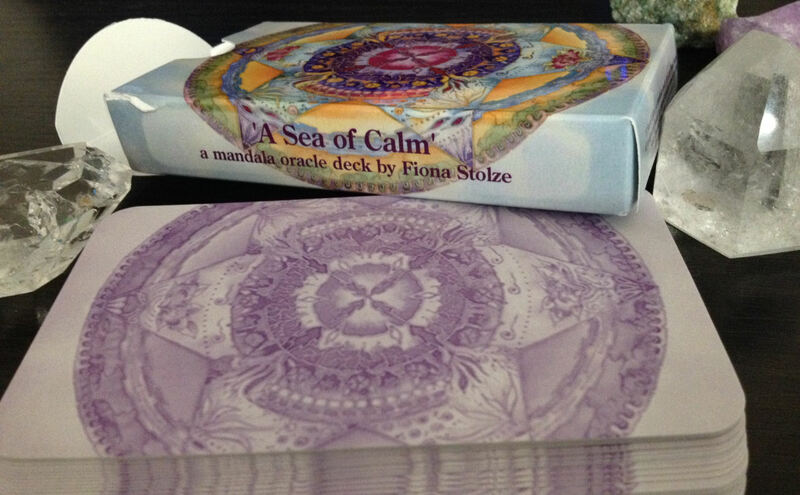 Stolze’s A Sea of Calm mandala oracle deck would be a great supplemental deck for tarot professionals who work extensively with East Asian cosmology or integrate Buddhism or Hinduism into their spiritual practice. Stolze’s work is really amazing. Check out more of her art on her website. You can also book a mandala oracle reading with Fiona here. For me, gazing at mandalas definitely have a calming effect, so I love the vibes of this deck. And, oh no! I’m an enabler! =) I feel bad! It’s okay. It’s tarot-community-karma. Sooo many tarot bloggers have enabled by tarot collection addiction, too. In fact, I’m pretty sure 90% of the decks I own were the direct result of some tarot reader’s recommendation. love the review, I’ve been tempted by this deck for awhile….btw what are the tow stones you show to the right? the greenish and the purple?